These creative beer mats aim to raise money for a good cause. Beer and football go together like an English penalty shoot-out and crushing disappointment. So with the 2018 World Cup just about to kick off, what could be a better medium for designers looking to celebrate the event than the humble beer mat? That's the thinking behind Weird World Cup, the latest project from Gordon Reid and Callum Stephenson. 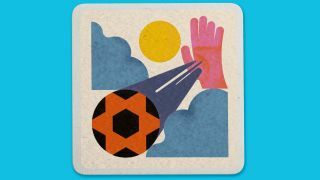 Working with twenty designers, illustrators and creatives – including Jack Renwick and Wade Jeffree – the Weird World Cup beer mats relive bizarre moments from competition matches of years gone by. Created using Adobe Creative Cloud and Stock, the mats are due to be 'exhibited' in pubs around London during the 2018 World Cup and are a tongue in cheek way to mark the occasion. "We always wanted the tone to be humorous, which is why the aim was always to keep the branding retro World Cup inspired," says Gordon Reid. "There were a few ideas of what we got the creatives to actually draw inspiration from and realised there were so many surreal and weird world cup moments over the years that it would really suit the artwork we were hoping to commission." Seeing as the World Cup is a global event, it makes sense that creatives from different backgrounds were invited to take part. "We chose artists whose work we admired, we also chose artists we knew, and for me some that I’d worked with before – in one case a previous Graphic Design tutor from my Sixth Form," says Stephenson. "I think we got a really great mix of designers which makes the series diverse." "We wanted each person to bring a different style to their coaster, be it 3D, illustration, typography, but we also wanted humour or a moment that was close to each artists heart to be prevalent in each one," Reid adds. Considering the number of artists involved, the pair quickly realised that giving creatives free reign to choose weird moments only worked for so long. "As the first wave of ideas started coming in we realised we needed to tick off the big ones like the hand of god or the Zidane headbutt," Reid explains. "We really wanted people to delve a little deeper and find some truly strange moments that were unique to them." "We sent across a small list of moments to be inspired by but most artists already had a favourite moment for its weirdness or personal connection so it made our job very easy, and also all of the outcomes have tons of personality and every beer mat is completely original," says Stephenson. As well as celebrating the beautiful game, Weird World Cup will also be a force for good as sales of the beer mats will go towards a charity the pair love, Football Beyond Borders. The organisation is currently fundraising for a new multi-purpose space in the Angell Town Estate in Brixton, which will act as a learning hub and safe haven for young people in London from disadvantaged backgrounds.